Have you ever eaten a Galette des Rois? This famous French cake, eaten only in January, contains a surprise! It's a tradition involving beans, figurines, kings and queens and you can read all about this essential part of French culture. You can listen to the French audio while reading the transcript (click to see the English translation and links to grammar lessons). When you're done, scroll to the end to kwiz yourself on some of the French grammar featured here. Mais qu’est-ce que la Galette des Rois ? 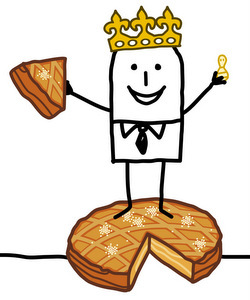 Comment célèbre-t-on la Galette des Rois ? J’étais couronné la reine hier quand j’ai goûté pour la première fois de La Galette des rois. J’aimerai savoir comment je couronne la reine suivante? J'étais couronné la reine is past perfect tense, not imperfect. I have to disagree that J'étais couronné la reine is the past perfect (pluperfect) tense and it is, indeed, the imperfect used in the passive voice. Your question is grammatically valid. Even if it were the pluperfect couronner would be conjugated with avoir rather than être ie. I believe it would be more usual to say, in general terms couronné reine than couronné la reine but if you are talking about the specific queen of the fête then la reine would be ok.
As for your question!! If I understand correctly you want to know how you would crown the next queen. As far as I know you wouldn't. You would be queen for the day and the next year everything would start from scratch again. If I am wrong maybe someone steeped in the culture could enlighten us. I think better would be "J'ai été couronnée (I was crowned). The last paragraph of the story says that the crowned king or queen must choose someone else after being crowned. I've never heard that before but that's what the story says. Absolutely correct: it is the imperfect in passive voice. But my question is about the last paragraph of the reading where it says the queen or king has to crown someone else subsequently. That’s my question . I think "choisir leur propre roi ou reine" means the person who finds the bean gets to choose his own partner. If he is crowned king, he chooses his queen. If she is crowned queen, she chooses her own king. Ah! Fantastic, I probably read it wrong. Thanks! '(Quelque chose) veut que + le subjonctif' - c'est une expression très utilisée ? Maybe la part is more of a share of something. Whereas la partie is a part of something. Or you mights wish for ‘une part de bonheur’ which is your slice of happiness! So, as you can see from those examples it represents the idea of a cake-like shape which can be shared out in triangular pieces. Pourquoi faut-il que le plus jeune choississe? Et pourquoi se cache-t-il sous la table? Comment choisit-il-- en tapant sur les pieds? I can only answer this in English. I think "choisir leur propre roi ou reine" means the person who finds the bean gets to choose his own partner. If he is crowned king, he chooses his queen. If she is crowned queen, she chooses her own king.